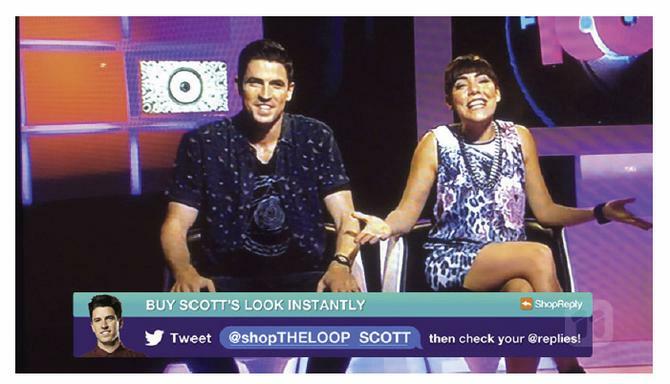 The new offering is based on ShopReply’s wallet technology and will allow viewers of the Channel 11 The Loop Program to buy clothes worn by the show’s presenters by either tweeting a certain brand handle, or sending a text. Glue Store has partnered with the show to compile a range of clothes and accessories immediately available to ship to viewers. Glue Store claims it’s the first time globally that Twitter has been used in a transactional capacity on a TV broadcast. “New delivery vehicles like ShopReply extend our business beyond the reach of just an etail or bricks-and-mortar,” said group marketing director for Glue Store’s parent company Next Athleisure, Prue Thomas. Sydney-based ShopReply (formerly BuyReply) offers what it has labelled a ‘transactional advertising’ platform that allows consumers to buy goods from any medium, including billboards, magazines or a TV commercial, without requiring an app. Instead, the offering is based on customers sending a short code by email, text or Twitter, which triggers a text message reply that they simply click and confirm. The company was launched in 2012 by entrepreneur, Brad Lindenberg, and raised $1m in funding to kick-start growth in April. Investors include Square Peg Ventures and Valar Ventures, whose lead investor is PayPal co-founder, Peter Thiel. “We believe that Twitter has the propensity to become a significant ecommerce channel capable of processing enormous transaction volumes by leveraging massive real-time TV audiences who are already tweeting, giving these audiences the ability to transact in real-time when they are emotionally engaged in content,”Linderberg commented. Linderberg told CMO shoppers who tweet or text to purchase goods are sent a link to a shopping cart, where they can choose options such as size or colour, as well as enter payment details and their delivery address. At the back-end, ShopReply sets up a merchant account and full ecommerce platform for brands wanting to sell goods through its service, which can be integrated with their own payment gateway preferences. Early successes for ShopReply have largely been in the traditional media space such as magazines and TV, where platforms have not previously been transactional, Linderberg said. Companies signed up to the ShopReply platform to date include publishing group, Bauer Media, which is using the technology to make its magazines ‘shoppable’. Linderberg said the partnership allows readers to instantly purchase multiple items and brands displayed on the pages of each issue through one checkout facility.